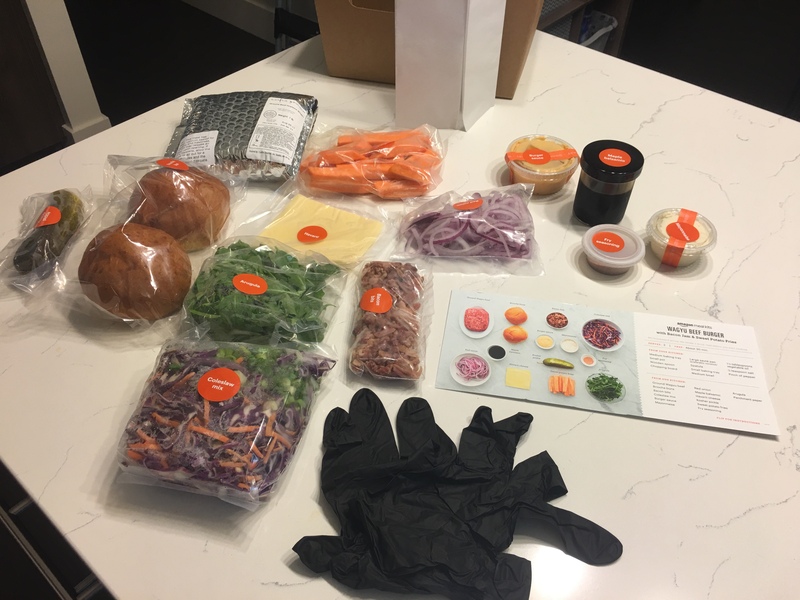 It’s been about five years since the first meal kit service started here in the U.S. As a picky eater, each time a new service joined the market, I investigated. At least initially, they were all subscription-based services with a limited pre-planned menu. They’re still subscription services, but there are more services and those services have more options. 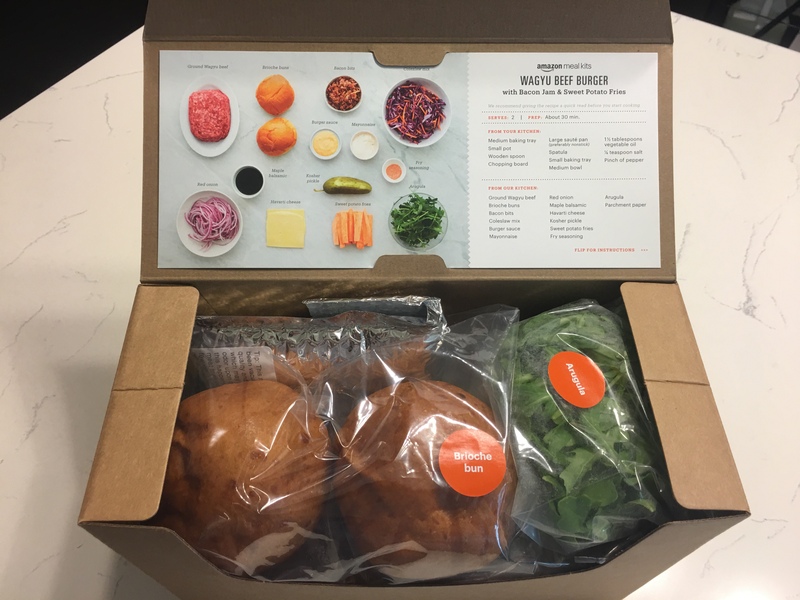 Amazon allows you to by one or a dozen meal kits whenever you like. In my case, I live in Seattle and work at Amazon. I can get a meal kit delivered to my office, or go into a special store where I can choose one off of a shelf. 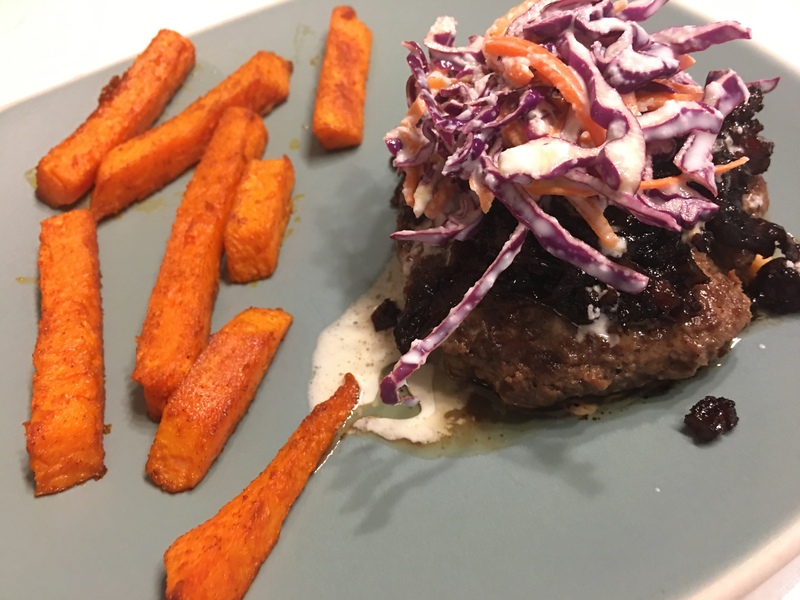 While standing in that store on a Tuesday afternoon, I decided to try an Amazon Meal Kit – WAGYU BEEF BURGER with Bacon Jam and Sweet Potato Fries. The box was pretty nice. It had a detailed photo of the items in the box. 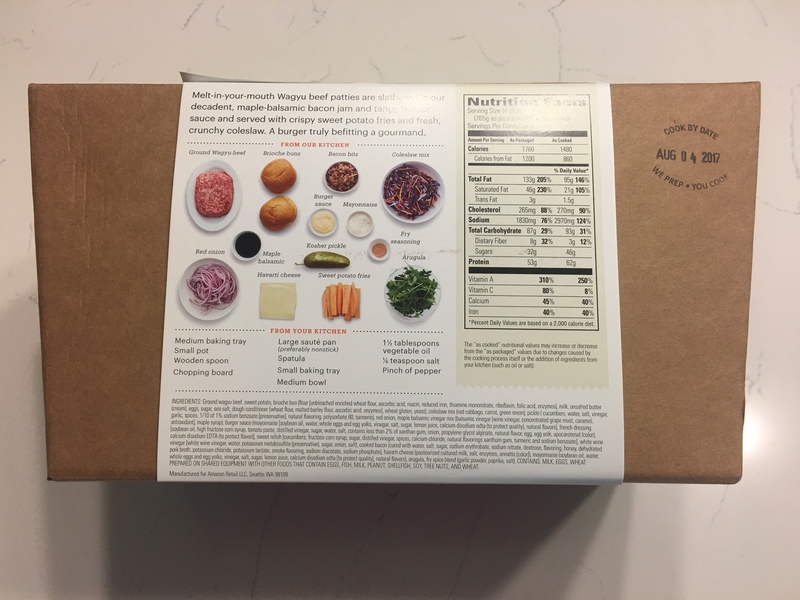 The box was stamped with a cook-by date, and included nutritional information and ingredients. It even included a list of the cooking supplies I needed to cook the meal. So I opened the box. It did take a minute to find the cooking instructions. They were on the back of the paper in the lid. The front of that paper included identical information to that on the outside of the box, so it didn’t add much value. I pulled out the ingredients. 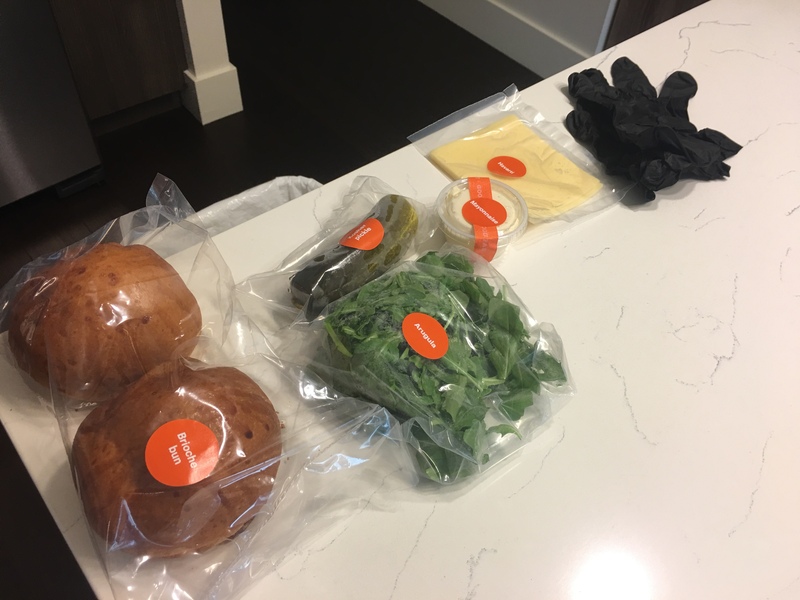 One great thing about the Amazon Meal Kit was that the veggies were prepped and everything was portioned exactly. I didn’t have to measure anything. There was no wasted food or prep time. The box also included rubber gloves and parchment paper. And the meat was extra-insulated. 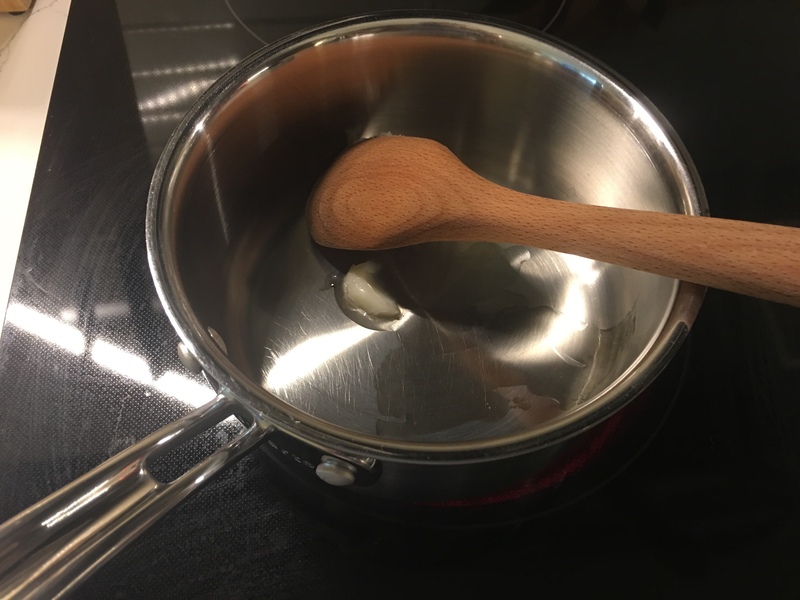 I gathered the listed supplies from my kitchen and started cooking. As instructed, I started with the sweet potato fries. 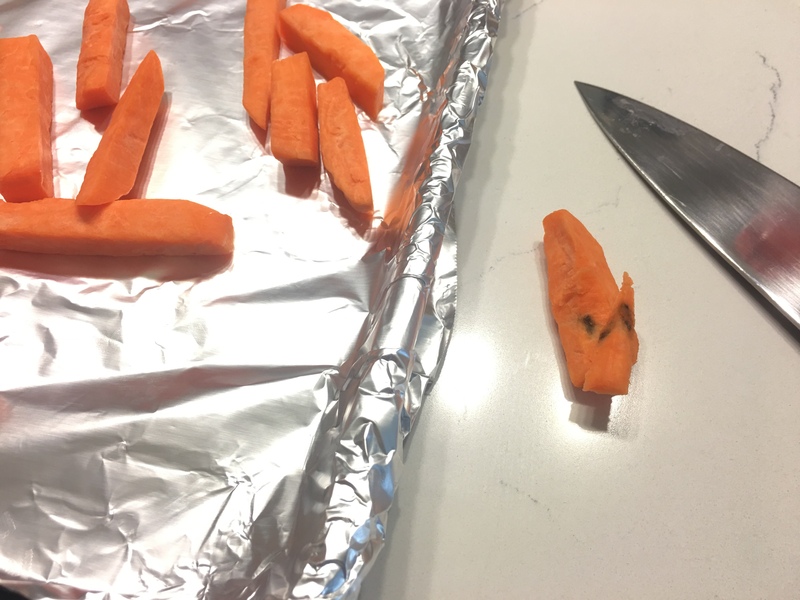 There was a bad spot on one of the fries, so I tried to trim it, but that fry was rotten all the way through. The rest of the fries looked good. 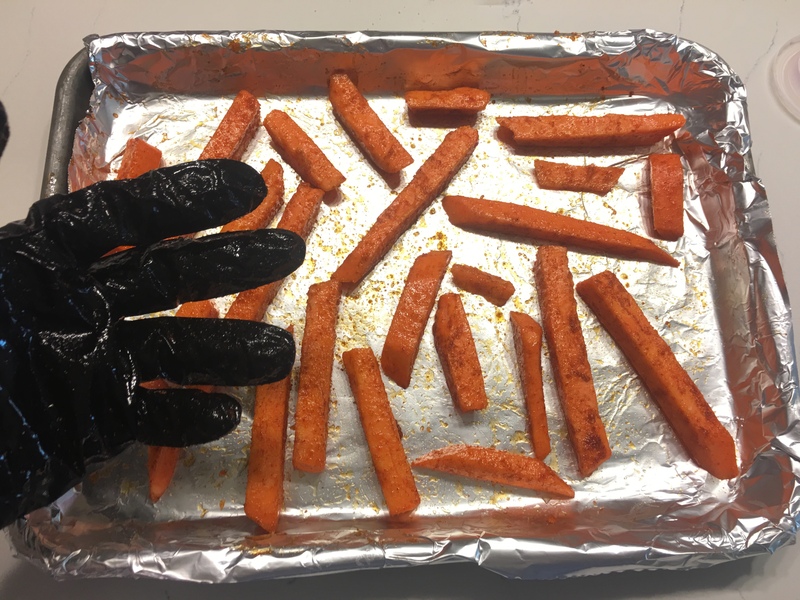 The instructions said to mix the fries, oil, and seasoning in a bowl, but I make oven roasted veggies all the time by mixing oil and seasoning in the foil-lined pan. I decided to put the gloves to good use by mixing the potatoes with them instead of my bare hands. It did save some soap and scrubbing. If you’ve never had onions caramelized in bacon grease, you are missing out. While the onions were cooking, I pulled out the burgers – only to realize that there were no burger patties. 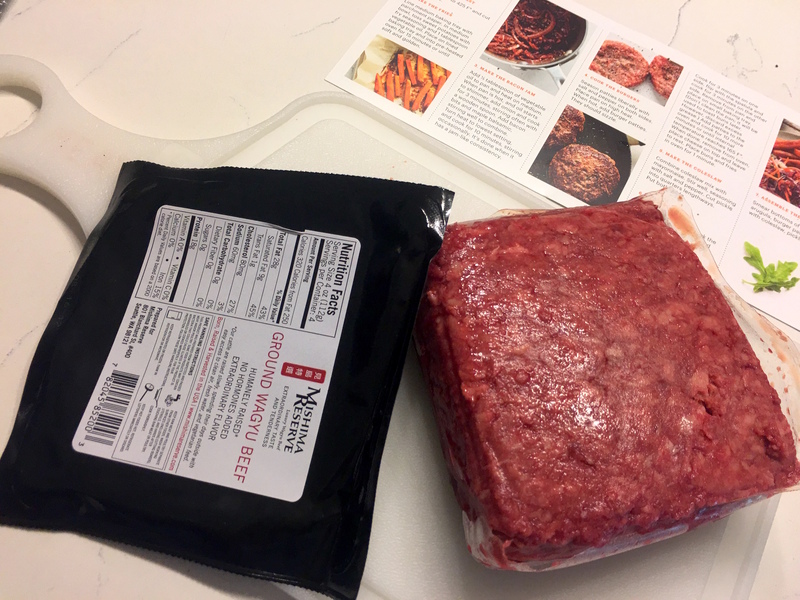 There was a 1-pound package of ground beef. 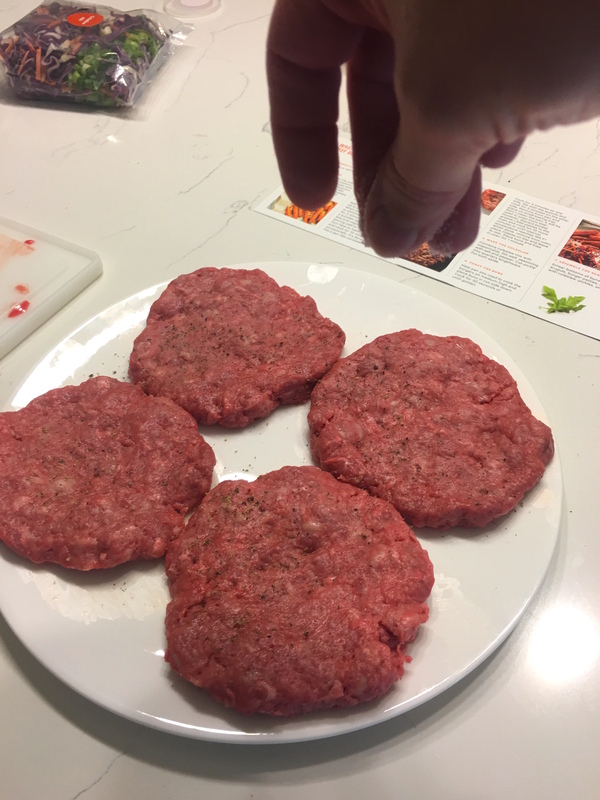 It was nice stuff, but there were no instructions for the size of the burger patties or tips for new cooks on how to patty them. 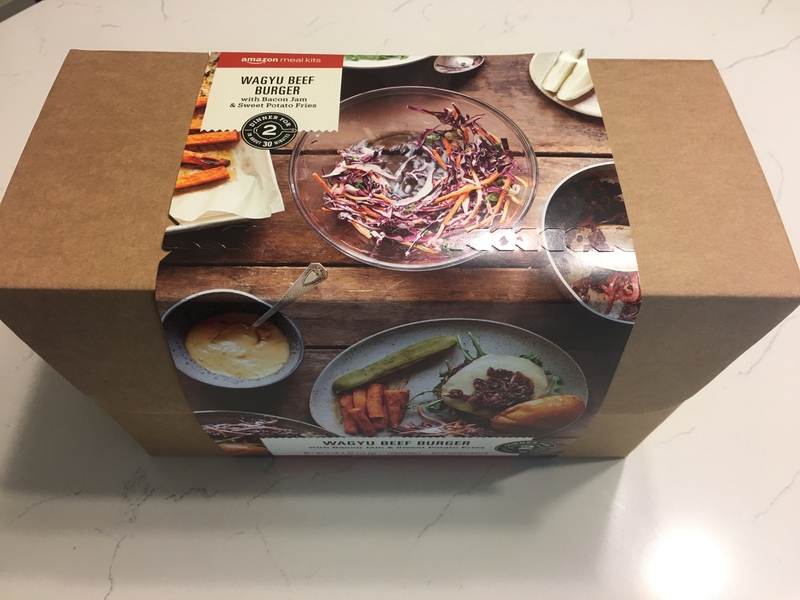 Based on the picture on the box, the portion size was a double burger, and the box included two servings. So that meant four quarter-pound patties. 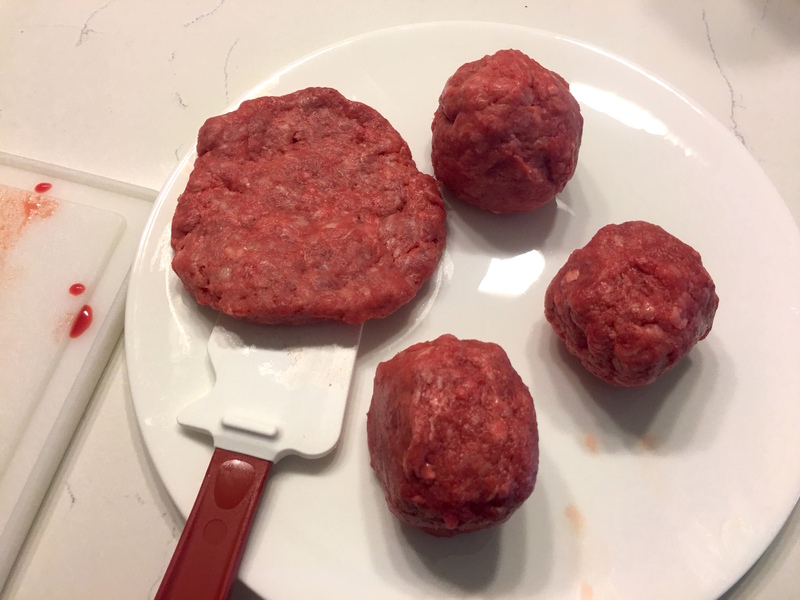 I cut the meat into four equal pieces, and made the patties, handling the meat as little as possible. If you over-work ground meat, it becomes tough. Slightly different than instructed, I salted and peppered one side of the burgers. I would season the other side of the patty on the stove. Again, always handle ground beef as little as possible. 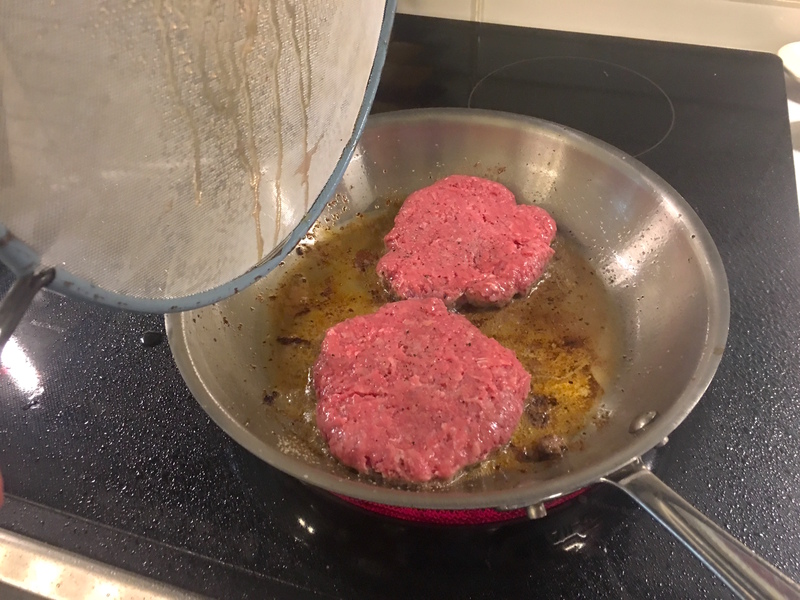 I chose to use a smaller pan and cook the burgers in two batches. I also cooked the burgers in bacon grease instead of oil. And, of course, I used a splatter screen to reduce the popping grease. 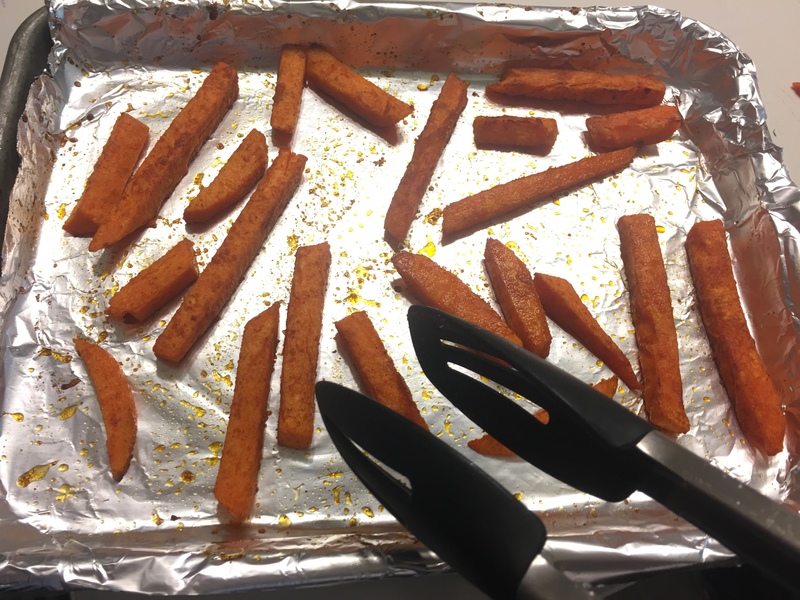 I pulled the fries out of the oven and flipped each of them over so they could brown on the other side. They were really soft, so I increased the planned baking time. I also don’t think this is an appropriate portion for two people. It’s worth mentioning that I roast potatoes nearly every weekend. I use this same method and they get beautiful and crispy every time. 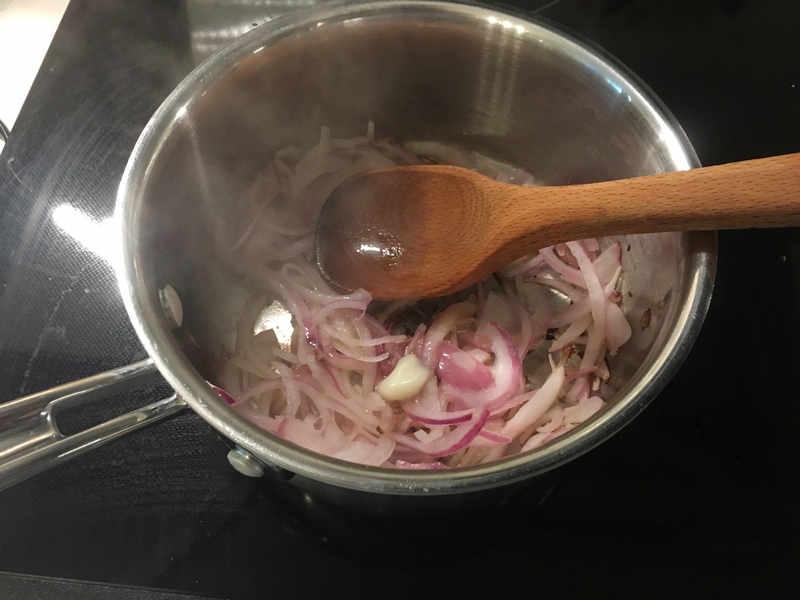 Back on task – while the fries continued to bake in the oven, and the burgers sizzled on the stove, I finished the bacon jam. The onions had caramelized nicely. I added the bacon and balsamic glaze and allowed it to simmer. The instructions for the cole slaw were to mix the mayo with the slaw mix. The slaw mix did include some chives, which I don’t like. Instead I used my favorite paleo slaw recipe to make the sauce for the slaw. 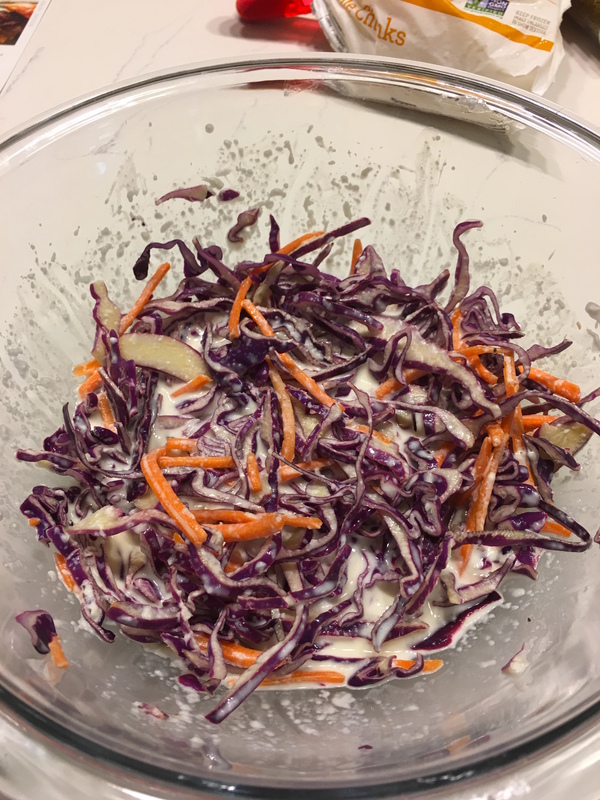 For the recipe, see Paleo Deli Style Cole Slaw. 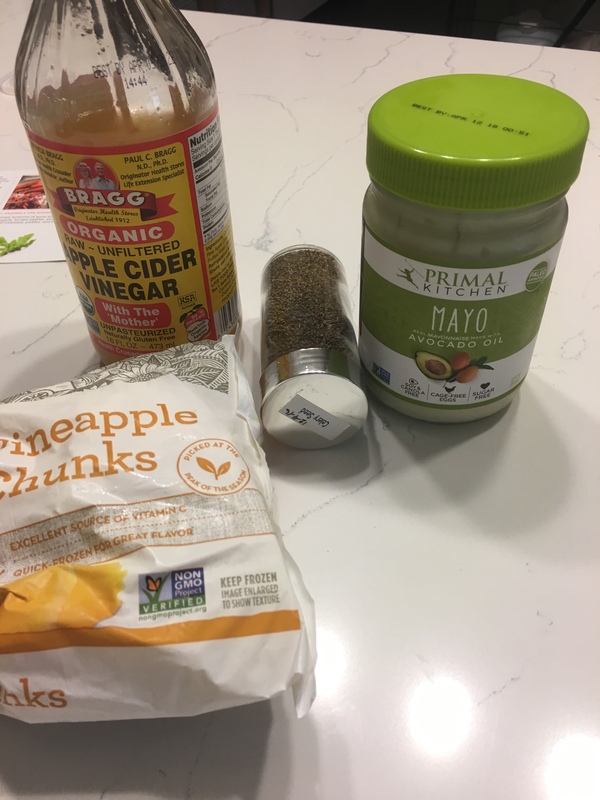 The recipe uses paleo mayo (that is pretty gross alone), cider vinegar, celery seed, and frozen pineapple. I’ve had this recipe before, and the flavor is great. It’s creamy, sweet, and tangy. I cooked the second batch of burgers and finished the bacon jam. It was nice and thick, and was one of the best things I’ve ever tasted. I was really excited to try it on a burger. I finished the 4th burger, pulled the fries out of the oven, and put my food together. The burger was AMAZING. I mean it’s as good as any $20 burger I’ve had at a high-end restaurant. And I paid $18.99 for 4 burgers. The fries weren’t good. The seasoning was a little too salty. The fries were squishy and bland. For real, when I reheat the burger, I’ll pull out frozen sweet potato fries instead. I didn’t finish the few on my plate, and threw away the rest. So that’s it. It was pretty cool. 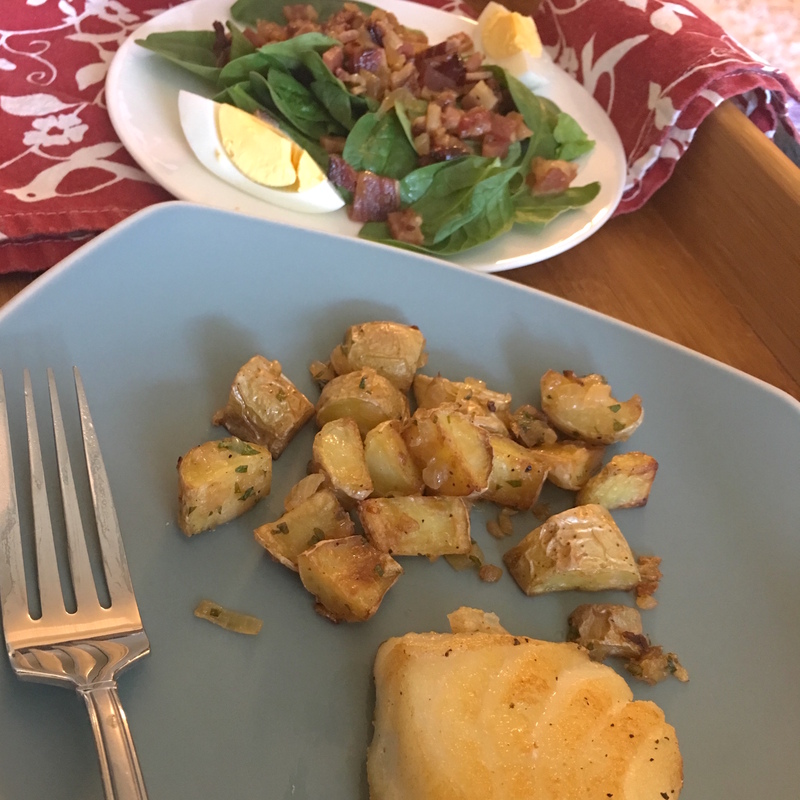 From start to finish, I had dinner on my plate in 30 minutes, as advertised. The food was good and overall, the kit included quality ingredients. The instructions were a little lacking, and the kit should have included burger patties. 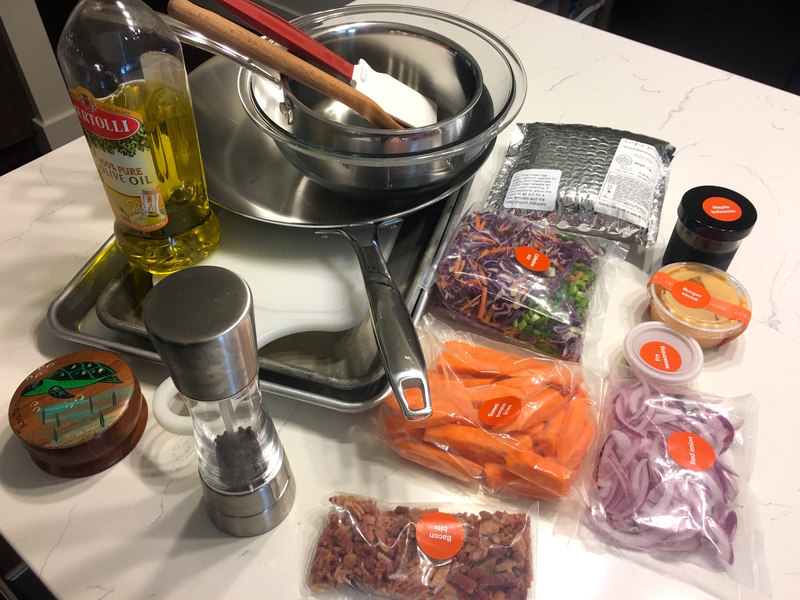 I liked the convenience of having prepped meals ready to cook on a week night. And the selection of meals from Amazon is pretty great. Because the ingredients are all separate, picky eaters like me can take out things we don’t want. I would order another Amazon Meal Kit. I do a lot of cooking from scratch on the weekends, but I usually need to cook a new meal on Wednesday or Thursday. These kits make it easy. I would also try a different meal kit company. If you’d like to try a meal kit subscription service, Observer has a great infographic to help you choose the best meal kit service for you. I would also recommend trying Amazon Meal Kits. Maybe next time I’ll try Sun Basket. 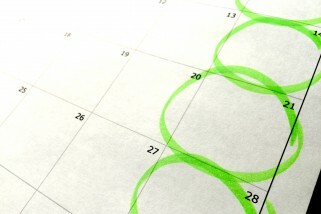 I’m a restaurant manager - turned software engineer - turned technical writer. I’m also a bit of a geek and can’t imagine my life without technology and writing. Epiphenie gives me an outlet for these two passions.